Key West is surrounded by a unique ecosystem at the fusion of the Atlantic Ocean and Gulf of Mexico. Here, you’ll find the third largest coral barrier reef in the world, much of it protected by NOAA’s Marine Sanctuary, and miles of shallow backcountry sand flats. This environment supports a diverse ecology of marine life unique to the Florida Keys and the Caribbean Basin. Some of these species are found in other parts of the world’s oceans, but many are unique to Key West. Read on to learn more about the marine life found in the Florida Keys. These colorful fish are named for their parrot beak-like nose and the manner in which they use it to chomp on coral, cleaning it of algae and distributing coral sands to facilitate healthy coral spawning. Their varieties include rainbow, midnight blue and stoplight. They’re amongst the most beautiful tropical fish in the ocean. You have a great chance of swimming with them if you go snorkeling in Key West. Damselfish are a species of small, triangular-shaped tropical fish with many varieties. In Key West, you’re most likely to spot sergeant major damselfish with yellow and black stripes swimming in schools. The barracuda is one of the ocean’s predators commonly found in Key West’s shallow waters. These long, silvery fish with sharp teeth are impossible to mistake and, although they may appear menacing, the chances of you running into any trouble with one is extremely rare. A useful tip is to remove your jewelry before snorkeling as it’s said barracuda are attracted to shiny objects. 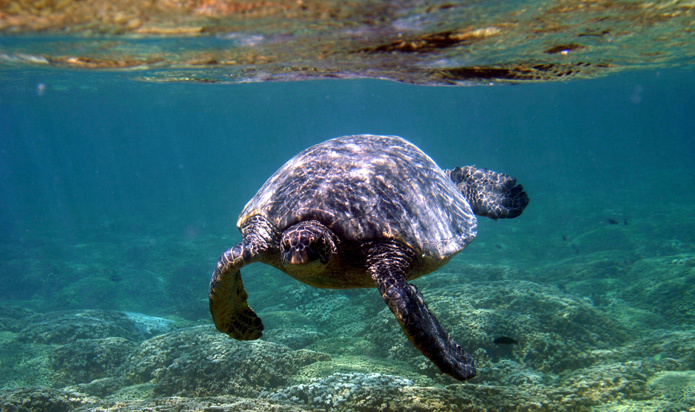 A variety of sea turtles are native to the Florida Keys and the most common are loggerhead sea turtles. These gentle, graceful marine reptiles have a life span as long as humans and can grow as large as 110 inches. They get their name from their enormous heads. Swimming in large schools, yellowtail snapper are perhaps the most abundant species of fish found in Key West. This is what barracudas prey on and what you’re likely to find on menus throughout the island. They’re characterized by their shiny yellow bodies and tails, of course! Grouper are also common throughout the Key West waters and another popular entrée at restaurants throughout town. Varieties include black groupers, striped groupers and the enormous Goliath grouper. Mahi-mahi are pelagic fish, so you’re not likely to see one while snorkeling at the reef. They’re a prize catch by deep sea fishermen and appear on restaurant menus. They’re characterized by their electric yellow-green skin and blunt noses. Hogfish are unique to Key West and amongst the most delicious when pan-fried. They get their name for their hog-like mouth and pinkish coloring. Stingrays are an exciting species to spot in the water and they come in many varieties in Key West, including spotted eagle rays and manta rays. You’ll spot these bottom feeders gliding along the ocean floor or partially submerged in the sandy bottom. Look for their eyes peering above the surface. In Key West, our lobsters are different than the more commonly known Maine lobster. Our spiny lobsters have antennas instead of claws, and their sweet meat makes them just as much a delicacy. Manatees are the gentle giants of marine mammals in the Florida Keys. Nicknamed sea cows, they’re often spotted in marinas. It’s important not to feed them as this area is dangerous with the abundance of boat propellers threatening their lives. Atlantic bottlenose dolphins are a thrill to see every time and they’re extremely common in Key West, where they breed and feed in the mangroves of the shallow backcountry. They travel in pods and can be quite playful, surfing and leaping through boat wakes. The most common shark species you’ll find in Key West are nurse sharks and reef sharks. They’re both nocturnal and relatively docile, so if you spot one snorkeling, don’t be scared! Enjoy the rare sighting from a safe distance. Nurse sharks are characterized by their slightly brown tint and catfish-like body and tail. Reef sharks are a shade of grey with a more traditional shark profile. Frigatebirds can be found gliding high in the sky across the jet stream out to sea. They’re considered good look by sailors as they signal land is close by. They’re easily recognizable by their forked tail. Cormorants are aquatic birds and talented fisherman. They can often be found diving from the mangroves into the shallow waters in search of juvenile fish and sunbathing with their black wings outstretched. Pelicans are a common migratory bird populating the Florida Keys in the wintertime. They’re easy to spot with their stumpy bodies and exaggerated beak. They’re also excellent fisherman, diving from great heights into the ocean for their catch.